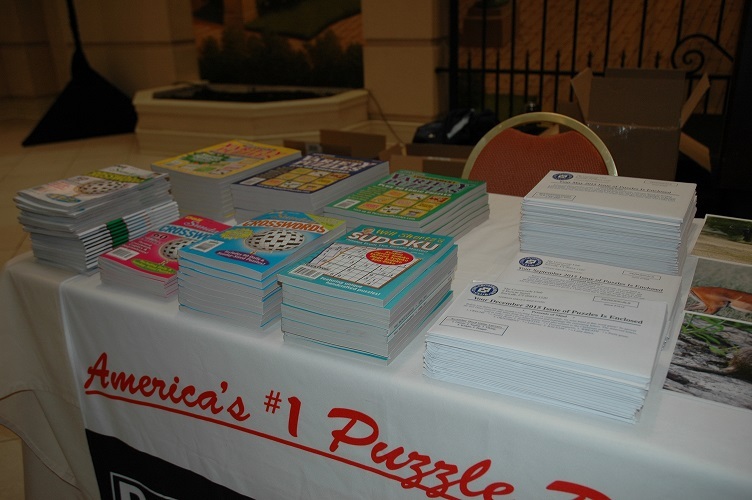 The tournament takes place over two days, with six puzzles to solve on Saturday, followed by one on Sunday. Then the top three finishers solve the championship puzzle on white boards in front of the audience. 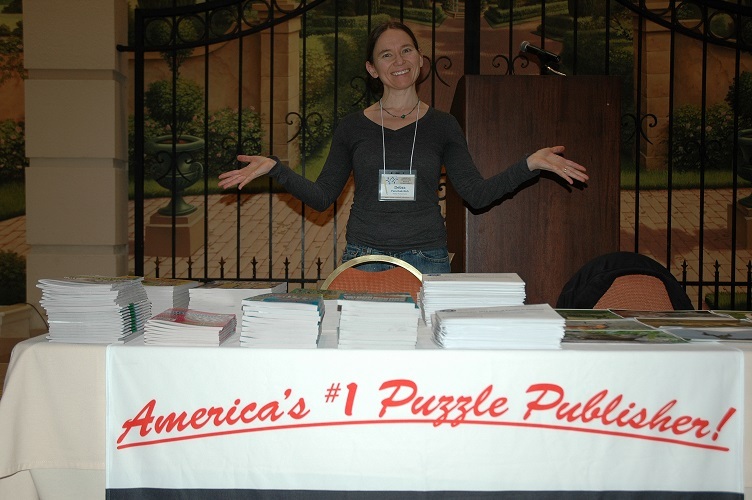 I made the journey down to Stamford myself Saturday morning and sat in with my friend, proofreader and puzzler Debra Yurschak Rich, at the Penny Dell Puzzles booth. 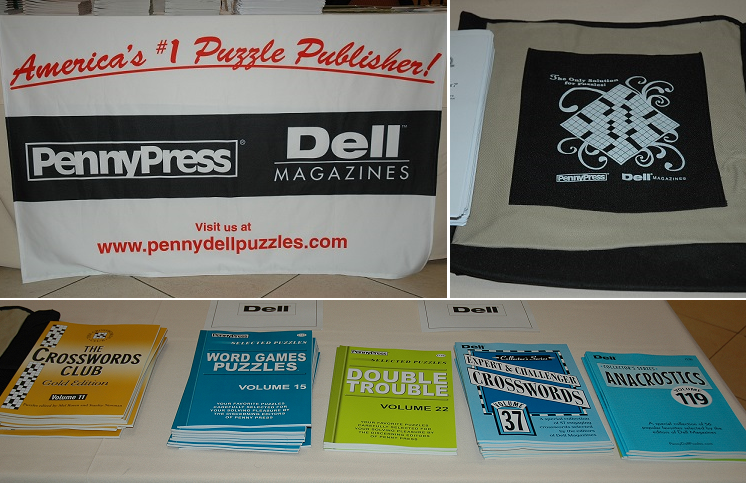 Our pals at Penny Dell Puzzles had a terrific setup as always, with great books and tote bags for purchase and a metric buttload of magazines to give away, including copies of The Crosswords Club, Will Shortz’s Sudoku, and several flavors of Tournament Variety, Master’s Variety, and Dell Sunday Crosswords! And they didn’t mind at all when I conquered and annexed the middle of the table for PuzzleNation’s in-person version of Friday’s View a Clue crossword animals puzzle. 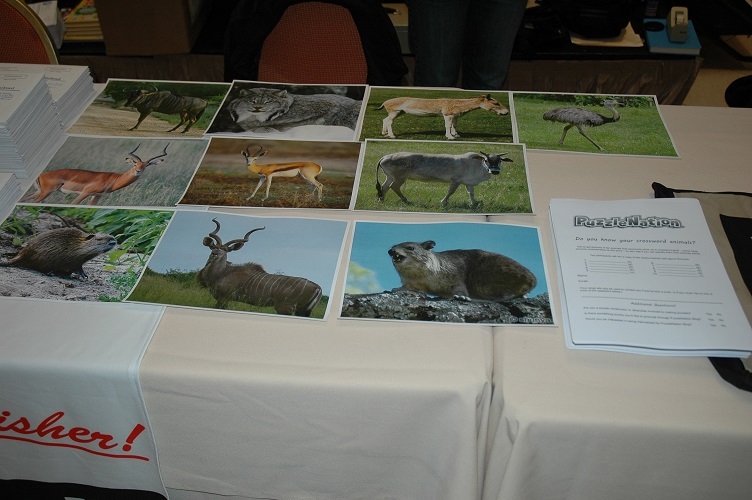 Many competitors stopped by the table to try their luck, allowing some to thoroughly impress their fellow puzzlers with their knowledge of African antelopes, while others were flummoxed trying to match names they’d written into grids dozens of times with images of the actual animal! 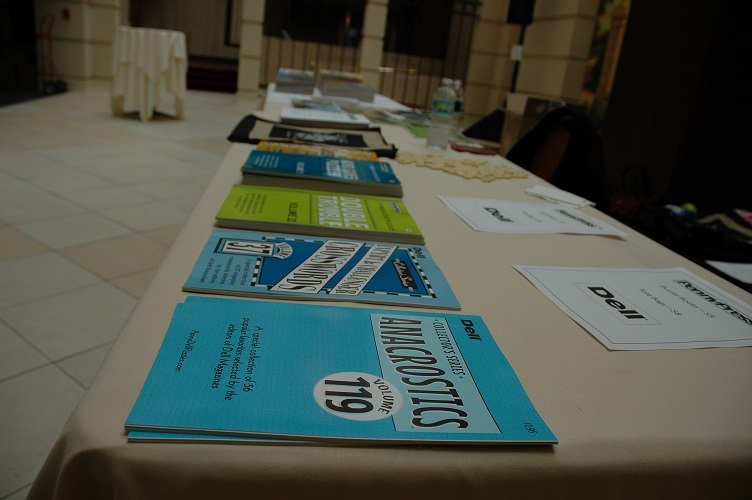 At 9 AM, the tournament was two hours away, but the marketplace was up and running. In addition to the usual ACPT swag, the marketplace included Hayley Gold and her Across & Down comics, the aforementioned Eric Berlin (repping his Winston Breen books and Puzzle Your Kids subscription puzzles), a collection of Merl Reagle’s puzzle books, and an impressive selection of puzzly titles from the marvelous crew at The Village Bookstore in Pleasantville, New York! Plus I got to see friends of the blog like Crosswords Club editor Patti Varol, constructor Ian Livengood, crossword gentleman Doug Peterson, and Penny Press variety editor Keith Yarbrough! Another treat of the tournament is getting to chat with numerous puzzle luminaries I’ve gotten to know through PuzzleNation Blog, like New York Times Wordplay blogger Deb Amlen, constructor and Pre-Shortzian Puzzle Project curator David Steinberg, constructor Joon Pahk, top solver and former champion Ellen Ripstein, constructor George Barany, Evan Birnholz of Devil Cross, top competitor Tyler Hinman, and, of course, New York Times puzzle editor Will Shortz. Puzzle 1 didn’t stagger any of the participants, although there was no repeat of Dan Feyer’s blisteringly fast under-two-minute solve like last year. 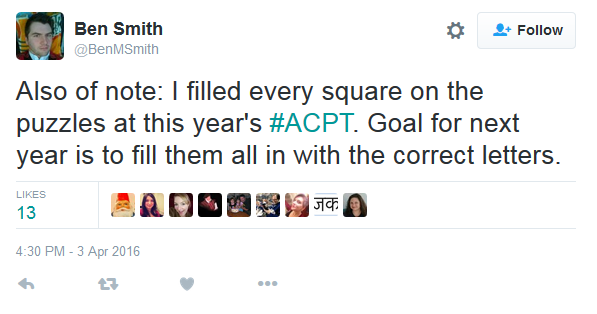 Three minutes seemed to be the benchmark for the top performers this year. But Puzzle 2 had a crossing that flummoxed several solvers: CORTANA crossing CONTE. Constructor Patrick Blindauer, not in attendance, was no doubt on the receiving end of some Puzzle 5-level heat for that one. But when Doug reached out to Blindauer, it turns out that THAT wasn’t Blindauer’s corner! It had been edited, with MONTANA becoming CORTANA. I had no idea puzzles accepted for the tournament were edited that much! 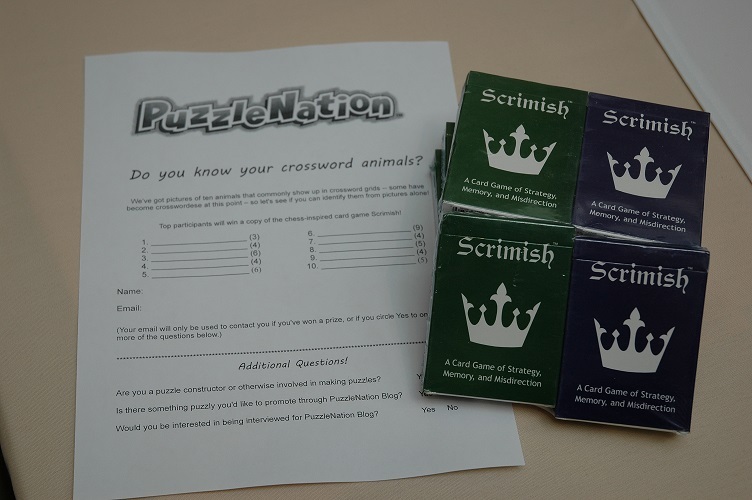 Puzzles 3 and 4 passed without incident, and people seemed to enjoy both the camaraderie of the event and the opportunity to compete against their own best times from previous years. Between puzzles 5 and 6, I handed out prizes for our View a Clue crossword animals game: copies of Scrimish, donated by that game’s terrific design team! Two copies went to our top performers — one got ALL TEN and another got nine out of ten — and two copies went in a drawing from all of the players who gave it their best shot. So congratulations to Robert Moy (who pitched a shut-out), Robert Kern, Abbie Brown, and the man known only as Dan (who got all but one)! After the diabolical inventiveness of Puzzle 5, Puzzle 6 was tackled by the solvers, who declared it a fun and fair end to the day’s competition. The solvers dispersed to rest their brains; we packed up the table, and headed for home. 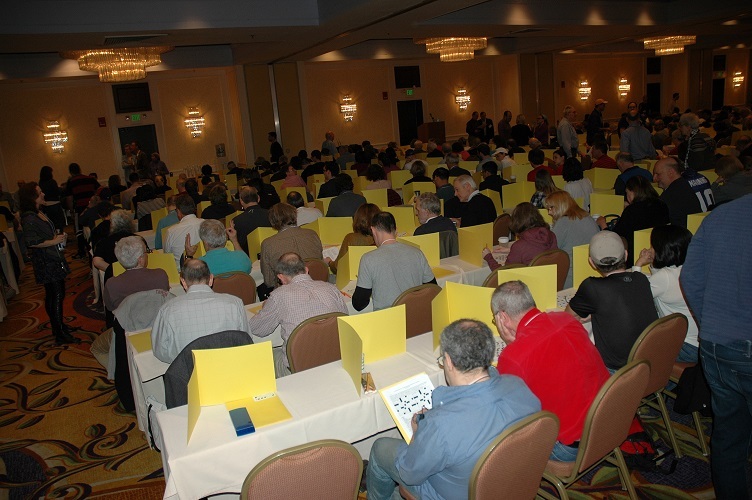 The day started off with Lynn Lempel’s Puzzle 7, which received strong reviews, but did little to alter the standings of the top competitors. Soon, it was time for the finalists to be announced. 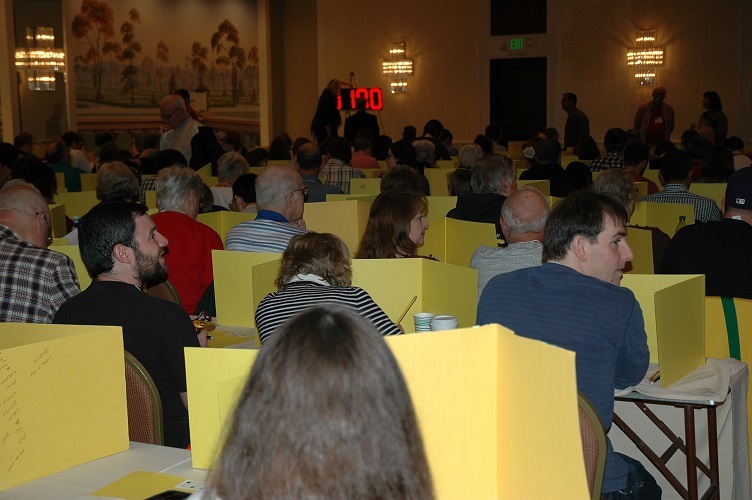 When it came time for the top three to solve on their whiteboards in front of their fellow competitors, two of the names were quite familiar to attendees: Dan Feyer, defending six-time champion, and Howard Barkin, four-time champion and perennial participant in the finals. He and Howard prepared for a thoroughly wordy and daunting battle with Mr. Feyer, whose excellent performance in the seven previous puzzles had him leading his competitors by three minutes. In a stunning upset, Howard Barkin did the seemingly impossible, besting Dan Feyer and claiming the top spot! The room erupted for him as others sat by, stunned that the expected seventh straight win for Dan was not to be. But that’s not all! 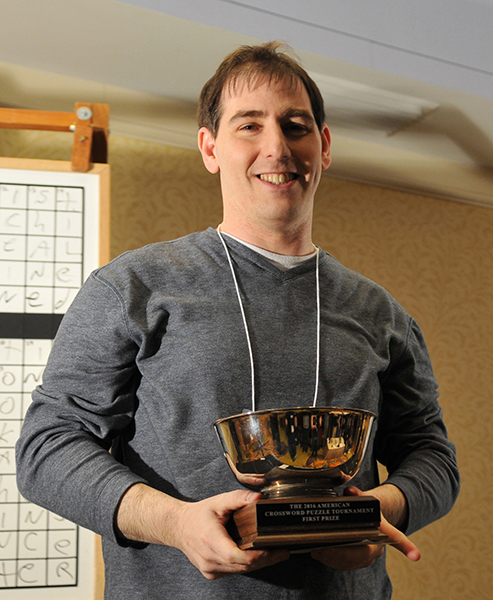 Friend of the blog and crossword gentleman Doug Peterson placed 13th overall AND won the finals for Division B! Congratulations to Doug! 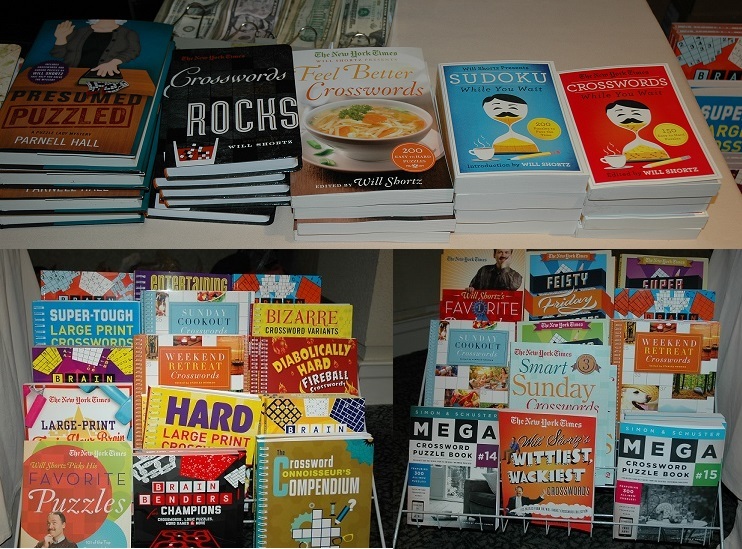 And it was a strong showing for many other familiar names! Patti Varol placed 97 (up from last year’s 109 showing), David Steinberg 113th, Kathy Matheson 237th, and Keith Yarbrough 266th out of a field of nearly 600 participants. It was certainly a day for surprises, strong emotions, and puzzly camaraderie. 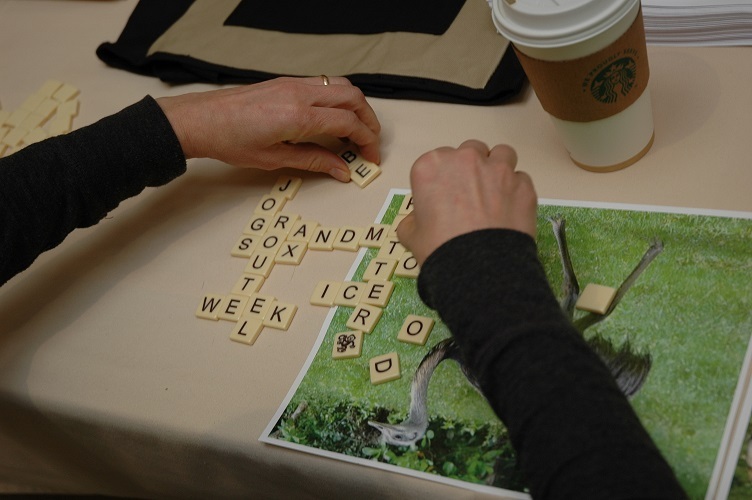 It’s always great fun to spend time with fellow puzzlers and wordplay enthusiasts, immersing myself in the puzzle community and enjoying all the charm and weirdness that comes part and parcel with it. This entry was posted in Games, PuzzleNation, Puzzles and tagged ACPT, Across & Down, Across and Down, Al sanders, American Crossword Puzzle Tournament, bananagrams, Barany and Friends, Ben Smith, Cluing, Cortana, crossword, crossword animals, Crosswordese, crosswords, Dan Feyer, David Plotkin, David Steinberg, Deb Amlen, Devil Cross, Doug Peterson, Ellen Ripstein, eric berlin, Evan Birnholz, francis heaney, Geeking Out, George Barany, Hayley Gold, Holidays, Howard Barkin, Ian Livengood, Jon Delfin, Joon Pahk, Kathy Matheson, Keith Yarbrough, Lynn Lempel, Merl Reagle, New York Times, New York Times Crossword, Patrick Berry, Patrick Blindauer, Patti Varol, Penny Dell Puzzles, Penny Press, Penny/Dell Puzzles, Pop culture, Puzzle Your Kids, PuzzleNation, Puzzlin' fool, Scrimish, The Village Bookstore, Tyler Hinman, View a Clue, Will Shortz, Winston Breen, Wordplay by gmdirect. Bookmark the permalink. A ‘metric buttload”???? What an expression!